With more than 20 years of experience in community arts and cultural development, especially arts and disability, DADAA has built up a suite of training programs available to groups and organisations in Perth and beyond. DADAA offers Disability Awareness Training to organisations interested in enhancing accessibility to participants and clients with disability. These training sessions focus on communicating with, welcoming and hosting visitors and audiences across all disability types. While useful for all organisations, this training is particularly valuable for local governments, businesses or community groups who engage with the public or have mandates to accommodate diverse audiences as part of inclusive practice frameworks. 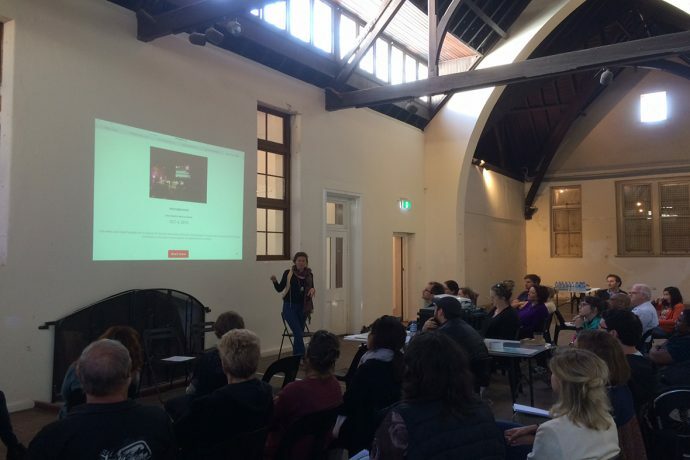 This fee-for-service training can be delivered in-situ at your organisation, or can be provided at DADAA Fremantle in the Old Fremantle Boys’ School. DADAA offers tailored two-hour training sessions that focus on working with people who are blind or vision-impaired. Services can be delivered at DADAA or at an external organisation requesting the training. Training encompasses practical and respectful ways of communicating with a person who is blind and vision impaired; guiding a person who is blind and vision-impaired; and welcoming a person who is blind and vision-impaired. This training is particularly suited to front line staff within organisations and at public venues. DADAA’s stARTSPEAK team offers customised touchpad training and digital arts workshops to individuals and organisations wishing to ready themselves for an NDIS and NDIS My Way world. We can provide iPads or work with individuals to tailor their iPads to their needs. stARTSPEAK software training for the Touch & Create and My Touchpad apps is core to DADAA’s touchpad training. The stARTSPEAK My Touchpad app is perfect for individuals to communicate to support networks how they utilise their touchpad. Watch the video below about DADAA’s touchpad training and digital arts project at Brightwater.